Metal Indian Princess Bangles for Girls! 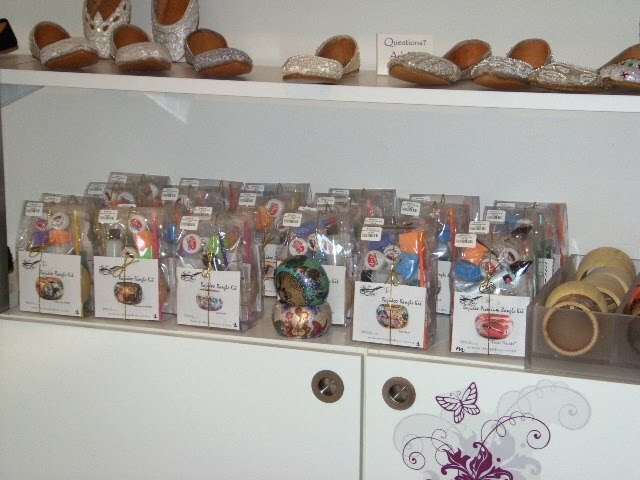 I have these wonderful women come into the shop and fall in love with glass bangles, just like I did many years ago! Sometime they have these beautiful little girls that also fall in love with the bangles, but they are too young to safely wear glass bangles. For you little princesses, I've added our new Princess Bangles in the store! 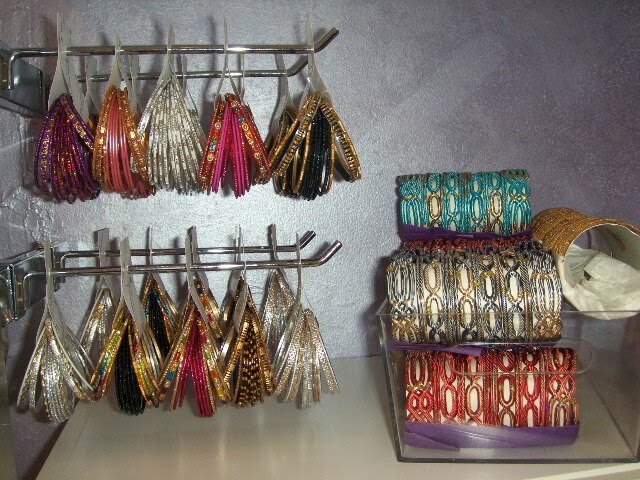 They are metal bangles so no worries about breakage and they are all the small 2.6 size. I also have a small selection of other acrylic bangles for little girls! All these are only $6 a set or 2 sets for $10! 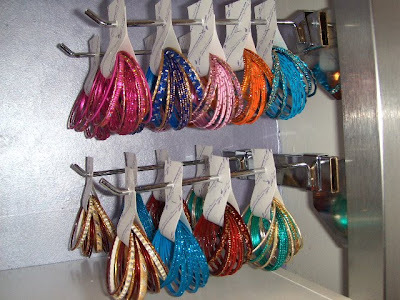 Yea for sparkly bangles for girls! 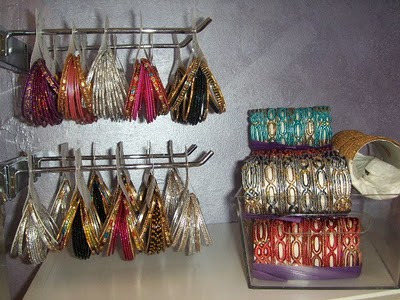 Indian bangles for EVERYONE! Woo Hoo! 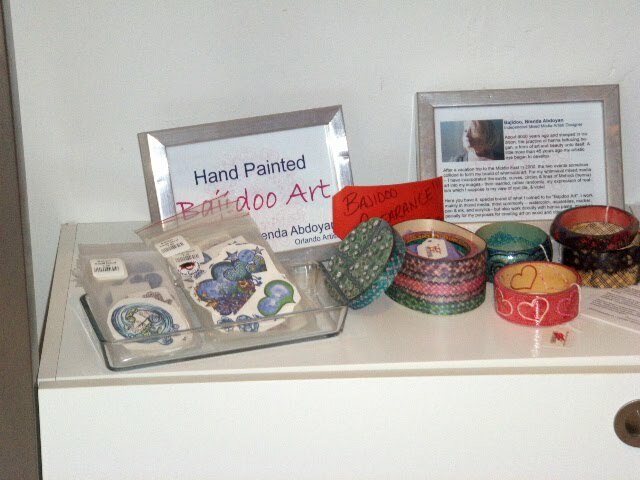 I have all kinds of new Bajidoo products including some BRAND SPANKEN' new DIY Bajidoo Bangle Kits. You have to stop in the store to check these out! All new art and a new Premium Bangle kit! Along with the kits I have additional blank bangles for you do-it-yourself-ers and additional Bajidoo art that can be purchased separately for your bangles. Here's to art YOUR way! Heather, of Peace Love, and Henna, made me this fabulous mug as a thank you gift! Heather created a henna business for her senior project this year, and I was lucky enough to help her out a bit. Many of us in the local Orlando henna community were privileged enough to give Heather a helping hand. Heather has become a wonderful henna artist, but she has also become a fantastic little business-woman with an emphasis on causes. Heather is my go-to artist for charity henna events! The pleasure was all mine Heather! I had a customer ask me for tips on preventing clogs in her applicator bottles and I'm always happy to share henna tips and tricks. I thought I'd share some thoughts and ideas with everyone! Straining your henna is the biggest thing you can do to prevent clumps and henna debris from clogging your applicator tips. Here are instructions for how to strain your henna. Straining is done after your henna is completely mixed and dye release has occurred. It's the last thing you do before putting your henna in applicators. You can also sift your henna powder, which is done before you mix the powder into a paste. I HATE sifting henna, and if you are going to strain your henna paste, there is no need to sift the henna powder. When I use standard henna powder I always strain my henna. When I use Jamila henna powder I strain about half the time. The Jamila henna is so fine and well sifted that straining isn't required. I still do it sometimes because if makes it so easy to get into my carrot bag and let's me feel like I'm doing all I can do, lol! Honestly, I don't see any difference when I do strain it, so don't feel you must strain Jamila henna. Using the polished stainless steel Moroccan applicator tips helps prevent clogs as well. Unlike Jaq tips and standard Moroccan tips (the ones with the plastic base), they are polished on the inside. 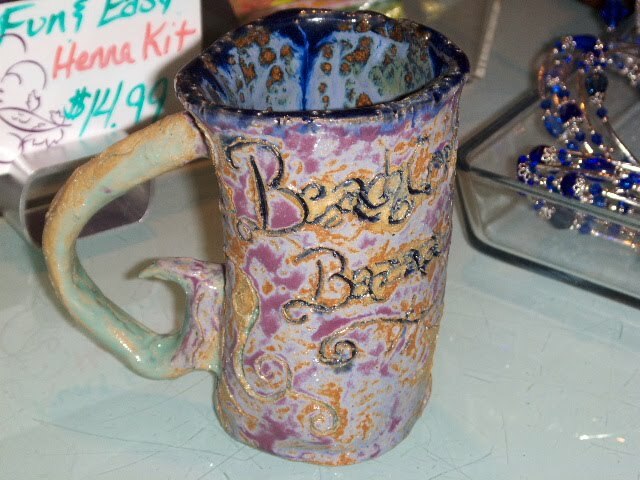 Makes your henna flow beautifully...like butta! Don't allow any henna to dry up in your applicator bottles or your tips. ANY dried henna in either tips or bottle will definitely give you problems with clogging. If you do let henna dry in your tips or bottles, clean them COMPLETELY. There are some things you can do when mixing your henna to help prevent henna clogs. Add sugar and/or oil to your henna. When you add sugar or oil, watch closely what happens to the texture of your henna. You will see the henna smooth before your very eyes! Try mixing your henna a little looser or thinner than normal. The thicker your henna the more likely you are to get clogs. Be sure it's still a usable consistency that you enjoy working with. Finally, you can use a larger applicator tip and still get fine lines. If you use a larger tip, you can control the thickness of your line by adjusting the speed that you draw the line. The faster you go the thinner the line! Try it! So there ya go! Jody's anti-clog tricks for today!